GoodSoundClub - Romy the Cat's Audio Site - Hi, John. My intro hello and first post, i just had to sign up. Just found the platform through googlin some hornstuff and came back too often.Especially the resonating oops was the latest topic that really cought my attention as im familar, and plan to share about that. My name is Josh, im 32 at the moment, experimenting with speakers for about 18 years now.Was lucky to meet some smart people in my early days to get cought by the passion.Then unluckily heard some which were way too good to be happy with anything below amazing.Consequently started to copy them, didnt succeed to the extend i was hopin for, kept me goin. He was a pretty interesting guy though, opposite to Ralph the engineer, he used to have the same education but somehow the logics left him at some point of takin too much drugs. Since then he was playing around with speakers and crossover-networks in a totally irrational way. Plugging together things without sense, just tryin to listen, modify, check again.... etc. Funnily, he was able to always create amazing stuff! At the end.He never measured a thing, setup xovers passive by ear, build horns by ear too with creapy shapes, and collected its drivers by going to the shop and hold them all up to the ear (without cabin or horn) and said yes or no. He has built hundreds of speakers, stuffing the flat till his wife complained (a tolerant angle though) and only dealed with exclusive pieces of massive quality.He has build one hell of a device, describing later below, that was "his big thing in a lifetime" that kept my trying to copy for ages till i noticed that my overall life quality decreased by this obsession. So one day, I thought f* it, ill just make him an offer he cant deny. Called, yes he couldn't, took a 10 years loan at the bank and picked up his system.It was quit neglected though for some years, so the first weeks were just fixing around.Not a good start. Also my room was crap, and i totally ignored any effort to find DPoLS, nor even the good spot.Next mistake, i tried to improve it. I measured it, and i started to EQ with DSP and phaseshift.Strange though, it only got worse and worse.So I got a little exhausted on that, build it all back to where it was, and even stopped listening to "audio" (apart from radio in the car which is not audio ).It kept collecting dust for about 5 years not even plugged in. Which was good for my other life at that time. Many years later in a nice home with nice job and some coins in the pocket i decided to come back. A bit, just a bit, buying a small ready made thing just put there looking nice and small, playing good music. That was a fullrange electrostatic, which i once heard accidentally and blew away all that standard crap and martin logan clichee. Great.So I got home, and noticed, the 120W Technics amp cant survive this load. Also Dipols are sensitive to the room, ESL dont make loud lows, and boom i was back into passion like in the old days. Also got me back on track to visit exhibitions where I heard by chance the Vox Olympian from Living Voice. That was stunning to me.Surprisingly Romy doesnt like it Youre the first of your kind! Id like to know more bout your impressions btw! So it all finally ends up on today, where i am in the process of building up based on that guy "Martin" from whom I bought the horns.With the new goal to try it one last time, but this time right, with the absolute ultimate horn, which is in progress, and will be called the martinshorn. Somewhere in the process of tweaking Martins system years back, I questioned a part of it. He used a 4 way horn. 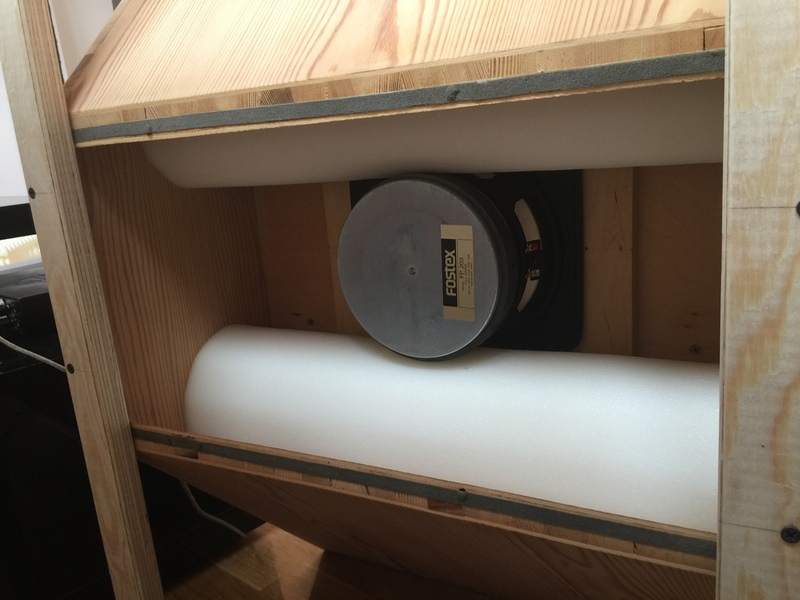 To connect the 2" compression driver to a modified khorn, he put a 8" frontloaded between. Not a bad idea. 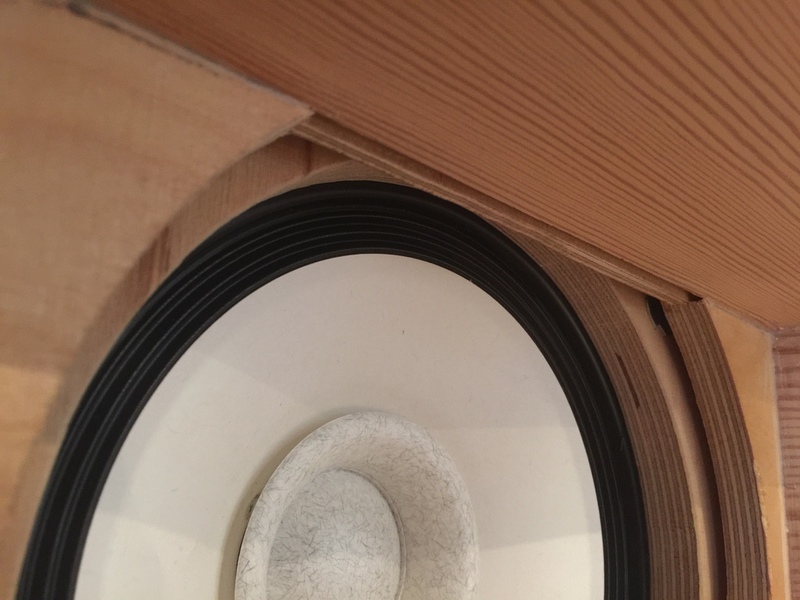 He said he was working 4 years on preparation, and one full year making dummies, over a hundred of its kind, to load his favorite 8" driver into a horn that was able to merge with the rest of the system - while adding a hard, dry punchy bass to the soft rolling ones of the basshorn, and 3 dimensional realism to the mids. He build a dozen of different principles, dozens varying shape and rearchamber, throat and angles for a tenth of an inch, back and forth, finding the perfect balance in sound. Like a maniac! Not as funny as it sounds if you life with him i guess. What bugged me was that upperlows-mid horn design. It ran from 150 to 1000 cycles. Apart from the horn being too small for those cycles, he cut a view slim and deep slits into the throat (like a 10th of an inch) to equalize some 2-5k shouts of the driver (you may call it a nano size helmholtz for HF). Weird stuff. Next point is the rear chamber where it gets really creepy. The front horn walls where about 5" thick, filled up with sand to kill resonance. A massive construction, to be lift by 2 people. The rear side though, had 2 kind of tunnels in a U-shape goin around the fronthorn, leading the rearphase sound to the front, left and right. Its increasing and again decreasing the size, and got pretty soft resonating outside walls. Also its being left completely empty. It measured horrible and couldnt reach the 150c XO properly, droping steep below 200. I thought ok, lets fix it and close the exits with dampings. It measured better. But suddenly one thing was missing in the sound, that I adored on that whole speaker system before. The ability to render voices and lowmid instruments almost 3 dimensional realistic with all the full volume of vibration like live into my room. 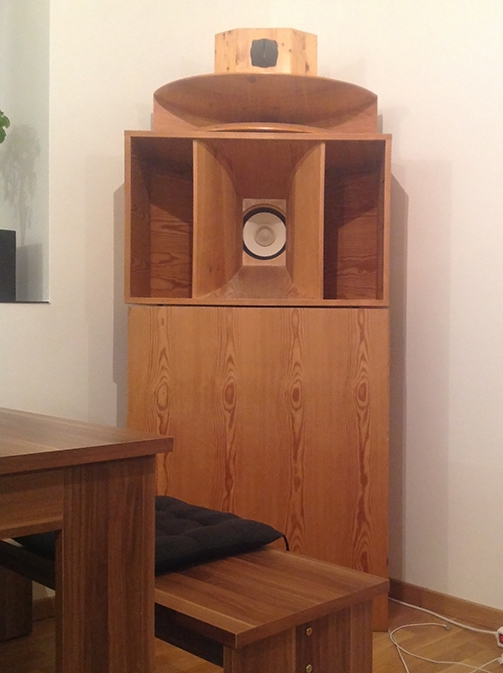 It was gone, it sounded clean and lean and dead like a standard speaker. No way, thats boring! So I never really got to understand what to do with it. Its fun, but its wrong. These are the facts. Till I got to read about the idea of the injection channel. I was frustrated that in my current draft of that "ultimate" system there was no space for such flaws. Space for a device that is so much fun and so wrong and full of problems to integrate. Space for something I payed a fortune for. Something that he payed a fortune for, not even mentioning the time of years of adjustments, sweat and blood. It would be a sin to put it aside as a dustcollector. But now, it found its destiny, as a separate injector channel, adding finally the 8th channel to the system. Ill add some pics soon to give you an idea. Wow, Josh, that's a whole lot of writing! Truth be told, I did not read it all, but I see (and hear) the back-horn. Hard to believe after all your experience that there is still "more" out there, but maybe you will also find time to read extensively through this site, including areas that do not appear to be aligned with your current interests. I don't get around much anymore, but IMO this site has become a pretty good repository of truly useful information about hi-fi, music and and listening. Hi Paul! Thx for the flowers. But its actually front loaded. I was long time done with the backloaded fullrange actually, dont like the performance at all, anymore. Yes, I see the front "horn", also the cabinet placement. Agree that you have resonance. "Recommendations" stand. Yes, that could be confusing. 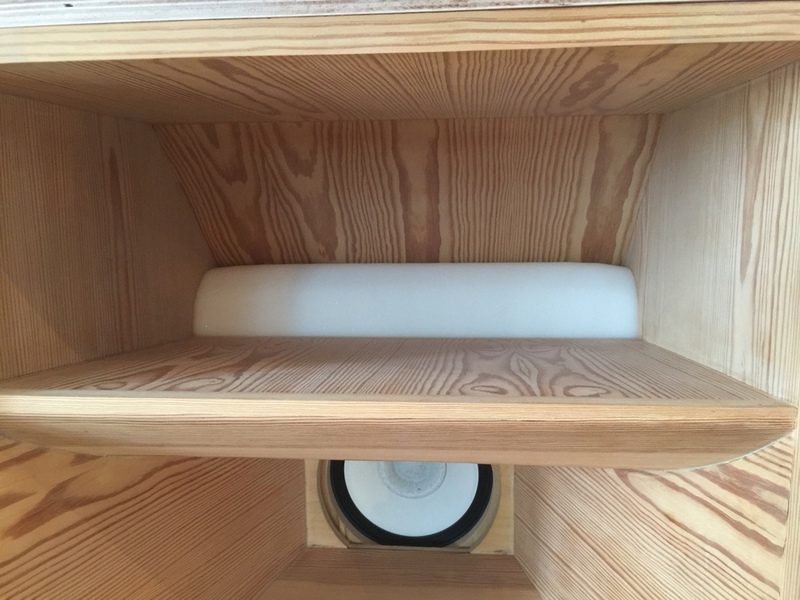 Regarding "horn", although you do it, I don't really want to call it a horn; but I do see a cabinet and corner placement that will add resonance to the driver sound, if that's what you want for (sorry...) "resonating oops". Regarding "recommendation", I am mentioning again that there is a lot of relevant information already posted here at this site, if you are interested. Hi Paul. Clear now. Well that "horn" actually adds a slight 6dB boost from 200 upwards, fading out around 1k. I assume that was just the missing piece to make most 8" driver (thats actually a fullrange) pretty flat up to the top. And likely what the inventor liked. Bout the oops, ive read a lot here, will find more. I wanted to share this particular piece as i very much love what it does.Can only encourage to copy. Equiped it with several drivers of Fostex, Lowther etc and they all worked well.Sure if youre hunting real efficiency or neutrality thats a no go. Hi, John, thanks for posting. Nowadays I can’t react the events of my site with the immediacy I use to do it. I have more kids then hands and I am a bit busier wiping noses to little them instead of wiping noses to typically-deranged internet audio people. Let me to make a few things clear from beginning. I do not think I “did not like” Vox Olympian from Living Voice. This is a big problem with… internet audio people. You see most of audio people do not understand audio, audio objectives, audio methods, audio language etc. They only accustomed to intellectual, spiritual and marketing surrogate that audio media trained them to consume. If after visiting the Living Voice I would say that it was the best sound I heard then the audio people recognize as a strong “buy” sign and the “accustomed” subliminal message will be delivered. Sorry, John, I do not operate in this dimension and I have no interest to massage the hungry for simple sensations audio horde. I do not remember now specifics about Vox Olympian but I do remember that there was tone that I like and there was something that I found was worthy to acknowledge as questionable or uncertain, in my mind an uncertain is something that worth discussion. If I hear “the best” then I do not need anybody to talk about. If you read my site that you will see that the majority of my feedback, including my own installation, it is about critique results, trying to understand results and thinking about the results not about worshiping results. About the playback that you presented. It is not a topology that I am familiar with it and to a large degree I do not understand what you have written when you went to specifics of the drivers and loadings. Not that I do not understand what you were trying to say but since I have no direct own practice to experiment with the single drivers corner-loaded acoustic systems I have no personal relation to what you meant to say. I heard many acoustic systems like that and I never developed appreciation to them, so I am naturally uninformed and not able to be a collaborator for you. Generally, from what I observe the people wo are pop up at this site not so savvy about the topology you use. I have been practicing multi-channel and multi-amping for 17 years this here are where my expertise are and I think it is where my judgment worth something. In the field of yellow drivers and a bunch of resonating chambers around them you might find only more practiced people then I am.